Just thought I would throw out a crazy idea, using a Dura Ace R 9100 power meter on a track bike. So I am a bit of a Shimano fan boy and have been toying with the idea of running a R9100 power meter on my track bike. Chain line would need to be corrected, I assume maybe a spacer on the rear cog. Chainring choice is 50t, 52, 53t, 54t, and 55t. Yes a little expensive but would it work? Would it be totally stupid? What do you think? Advisable? Eh probably not, even if you already own the unit. This has been done before (road PMs on track bikes). I’ve never done it, but I’ve seen it done. You can get 95% of the data you need to make actionable decisions in your training regimen using speed, cadence, distance, time, and heart rate data. Basically everything but the power meter. Getting that data will cost just 20-25% off what the entire power meter kit costs. The 9100 is a little weird in the area around where the chainrings mount... it makes it basically incompatible with older 4 bolt rings. The issue here is that means your "go to" solution to go road-track (A B-Dop adapter) may not fit. (I don't know of anyone that has tried) Now you're back to either a.) custom solution that's similar or b.) trying to make a normal 4bolt 110bcd work on a track bike. Another thing to consider is how that power meter is going to handle / interpret what happens when you put backpressure on the pedals. Different power meters not intended for track use handle this differently. I'm not sure how the R9100 would handle it. If it starts throwing in 0's (or it just frazzles it) then you're going to spend a lot of time in your program of choice trying to pick out useful data from noise, basically making it a headache every time. Again, not sure how it would handle it, but those are possibilities. All of that without mentioning the R9100's already "meh" reception and reviews. On track, you REALLY don't want a "meh" power meter. Since most places don't let you look at your head unit anyways, you're using the PM for post-ride/race review... in which case you really want to trust that what you're looking at hours later in a graph is a true representation of what happened on the track. Again... can be done... certainly... with some amount of success anyways. Using the DA power meter was just a thought. I appreciate everyone's input, so how about this? I really am set on getting some sort of power meter in place. My two thoughts are, #1 low cost and #2 unlimited budget. For option # 1, I was considering a Gen 3 Stage DA unit and paring it with a Garmin hed unit. This option would match my current cranks and I could begin to learn how to use a power meter. My understanding is that it would not be ideal for my main focus, standing starts, 500m etc, I could eventually move it to my endurance bike. For option #2 , I was considering a Rotor SRM unit and paring it with a SRM PC7 head unit. This option should last me forever. I would welcome more of the valuable feedback from this forum. Thanks for helping to educate me! The same seems to be true for most of the other PM's often used on track. The pedal based systems (garmin/powertap, not sure about the new Look) generally don't start picking up data immediately, even if they are "awake." If you're a sprinter looking for a PM... it really is an SRM. Preferably an old wired one with the PCV. *all the above of course depends on just how much you care how accurate your data is the entire length of an event. Everyone has to decide this for themselves. So, unfortunately you have confirmed my understanding on the Stages. Its limitations regarding standing starts rules it out. I guess it comes down to choosing between an SRM track or Rotor SRM track. How would you base your decision? The Rotor vs. the Science really comes down to what bb/crank system you prefer. I like that the DA7700 bottom bracket is tuner friendly but most folks aren't that nerdy. 2) If standing starts are going to be your focus (team sprint, 500m, kilo, etc...), basically short efforts as opposed to longer, steady-state efforts (3K, 4K, points, scratch, etc..), you'll want a tried and true crankset to handle to power output reliably and you'll want a head unit that records at a rate of every 0.5s (most record every 1s). This gives you more data points for the short efforts. I believe that the SRM PowerControl 7 is the only unit available now that can do this (someone correct me if I'm wrong). It's ANT+, so it can work with a variety of sensors and cranks, not just SRM products. This is like any other hobby. You can sort of dabble in it and buy the $100 guitar + amp combo from Guitar Center and definitely start learning. And you can cobble pieces together over time and whatnot and trade up (taking a small or large loss every time), or you can set a plan and buy quality pieces that will last you for years that will have very good resale value if you leave the hobby. One option which hasn't been referred to above is the Verve InfoCrank. I decided to go with one of those over an SRM when I bought one a couple of months ago; essentially the fact that it's about half/two-thirds of the price, doesn't need magnets for cadence and has replaceable batteries swung it for me. British Cycling used them for years (not sure if they still do) and it is a dedicated track unit; as others have said, the SRM is pretty much the only other dedicated one. Your mileage may vary. As has been said above, if you need to get every last scrap of standing start data then the SRM is probably the way to go. If, like me, your focus is more on data gathering more along the lines of what I do on the road, the InfoCrank would almost certainly be a far better option than bodging a solution with a road power meter (leaving aside, as was said above, that the Shimano product doesn't seem to be all that good in any event, even for the road applications it's designed for). If I feel I need the extra data in the future I may upgrade, but that's what I would say as matters stand. How does it measure cadence with out a magnet? Accelerometer is my best guess. Just like the way your cell phone measures steps/pedometer. InfoCrank uses a reed switch, triggered by a fixed magnet mounted on the bike frame. All Reed Switches are activated by magnets, including SRMs. 2 and 3 point to the magnets. 1 and 4 are the torque sensors that collect torque and transmit when the Reed Switches therein are activated when they pass the magnets. The head unit receives the transmissions and notes how often they occur...and voila, that's your cadence: How often the Torque values are transmitted. Next, it was time to install the cadence magnets. As stated earlier, a Praxis bottom bracket is recommended for use by Verve Cycling since the magnets are easily slipped onto the cups and secured by set screws. The R5ca uses a direct fit BB design so I am forced to stay with the standard 30x42x7 (6806) BB30 bearings plus BBRight spacers. This also means that I need to use the other cadence magnet option that comes in the accessories pack. This second set of magnets (shown below to the right) uses a 3M adhesive that you unpeel and stick to the underside of the BB shell. As you can see in the picture above, in order for it to fit and work correctly, I had to cut it in half as well as trim the sides so that the magnets would sit outboard as much as possible. 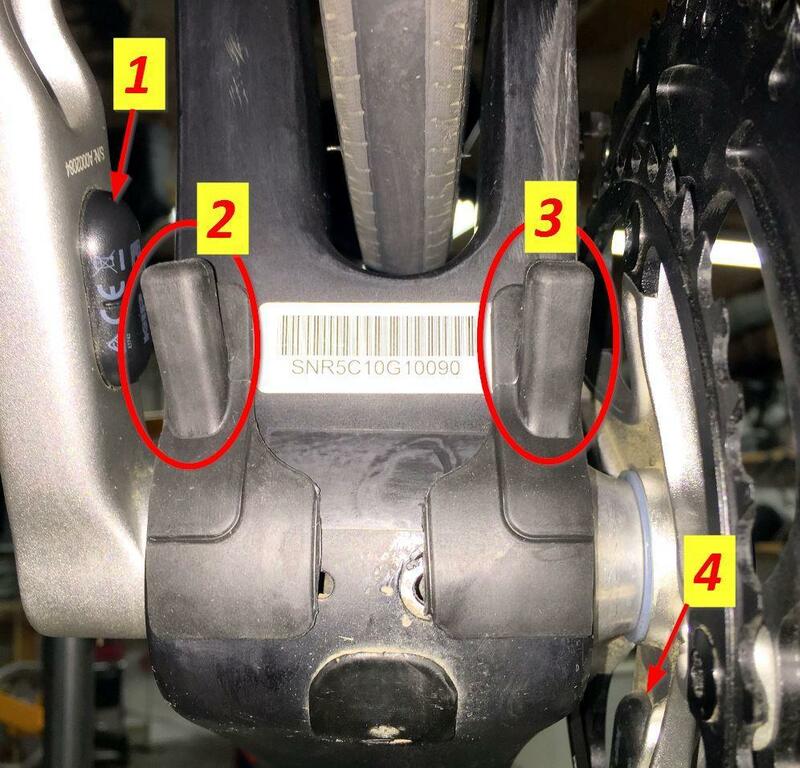 In the picture above, #1 and #4 are the cadence sensors embedded into the crank arms, #2, #3 are the magnets. The key is to get the magnets as close to the sensors as possible, mark the outline of the magnets, unpeel the tape then stick. A quick check by spinning the cranks and watching the green lights flash told me everything was installed and working correctly. Next, I checked the torque on the chainring bolts followed by pairing the Power Meter to my head unit. Lastly, I calibrated the power meter. A quick spin around the block showed me that everything was working perfectly. Last edited by carleton; 12-30-18 at 01:12 AM. hmm, infocrank might be a solid choice then.